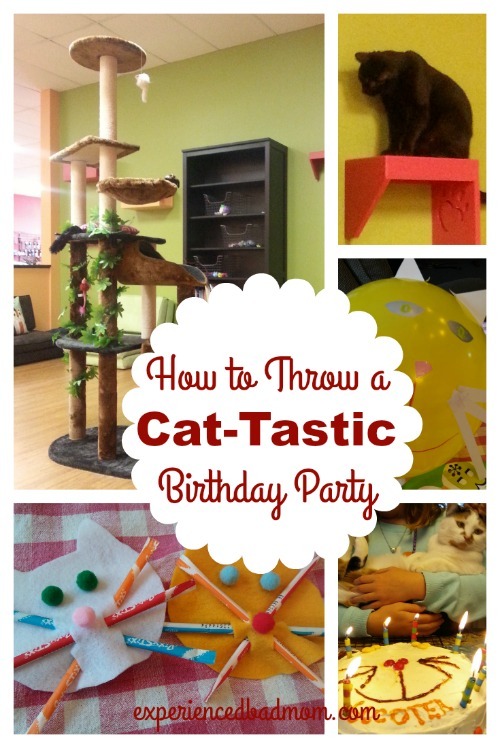 Want some ideas for your next cat-tastic birthday party? You’ve cat to be kitten me right meow (I couldn’t resist). While I’ve never ordained myself as a Pinterest-inspired, party plannin’ Super Mama, I have been around the block a time or two when it comes to birthday parties. Remember when I organized a whole birthday party around a rock? And, a rock as in a geological formation, not rock-n-roll? Well, this year when my daughter turned 10 she want a meowy special celebration. Here are the cat-tastic details in case you need ideas for the purr-fect cat party. Our local Humane Society opened a cat cafe last year and that’s exactly where my daughter wanted to celebrate. 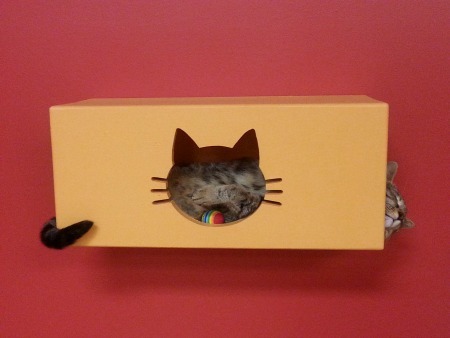 What is the cat cafe? For a modest admission charge ($7/hr), visitors can play, watch, and enjoy the 20 adoptable cats wandering throughout the cafe. The goal, of course, is for people to come in, fall in love with, and adopt their new best friend. We skipped renting the party room that cost $175 for two hours. For our small group of four kids, it didn’t make sense. Instead, we spent an hour admiring and playing with furry friends. My daughter even asked for donations for the cats in lieu of gifts. Her friends came through big time donating toys, food, towels and litter! After our hour was up at the cafe, we headed back to our house to continue the cat-tastic birthday party with pizza, cake, and crafts. Let me just note that 10 year olds can pound pizza. Gone are the days of kindergarteners who eat half of one piece. 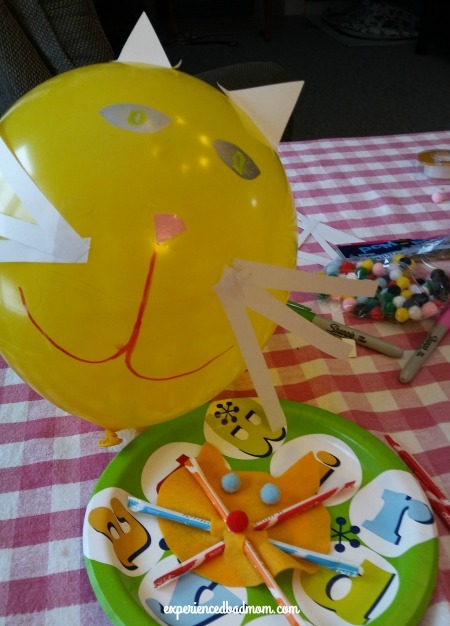 After lunch, the kids decorated balloons with whiskers, eyes, ears and noses. Then, they made cats with felt cut-outs and Pixie Stix. They picked out pompons for eyes and a nose, which I hot-glued for them, before we threaded Pixie Stix candies to make the whiskers. Note: one kid LOVED eating the extra Pixie Stix way more than making the craft! My daughter and I made a two layer cake along with a couple cupcakes that we made into ears. 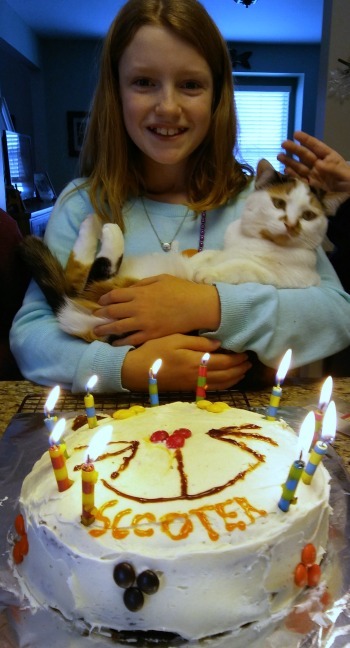 We decorated the cake like our calico cat, Scooter, using simple frosting, gels and candies you can pick up at any grocery store. It was a meowy special ending to the party as each friend took home a goody bag with Grumpy Cat stickers, a tiger print notepad and pencil, and “meow mix”, a blend of fish-shaped crackers and gummies. Our cat-tastic birthday party was fun, cuddly, crafty and memorable. Purr-fect! Do you like cats? What’s your favorite birthday party theme? 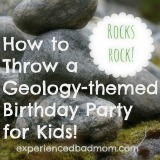 Looking for more birthday party ideas? Maybe they have a party room! Or you can make your own party with a few friends. I know our cafe is very mellow. They play soft music and have scented oils or something like that burning. Very calming, which is a good thing with kids. thanks for the tweet, too! What a cute idea! This is the age where themed birthday parties get to be tough, so I like the idea of taking the girls to the humane shelter to hang out with the cats. I enjoyed this year because she just wanted a few close friends, not the whole class. It was much more manageable at the cat cafe that way and everyone had time to hang with the birthday girl, too. Okay, this is adorable! We love cats in this house–we have two of them. My daughter would love a party like this. I wish we had a cat cafe nearby! Fingers crossed you get one soon! They are neat. Our town might even get another. Carolina Twin Mom / mary Peterson recently posted…Time to Take Toys from Turmoil to Tidy! I know, right? It’s very soothing there, too. They even have yoga with the cats on Sundays. It seems to be a trend around these parts (maybe it’s the kids’ older ages?) for all her friends to ask for donations to charities rather than gifts. Still, it’s a great idea and I was proud! Wonderful idea for a themed party! Thanks, Jen! I think Humane Societies across the nation will be catching on to the birthday party idea. It’s a win-win for everyone. Oh my goodness, that’s the cutest idea ever! I know my kids would be begging to take home half the cats in the place, but how sweet is it that the kids get time with furry friends, and the cats get time to interact with people. Love it! 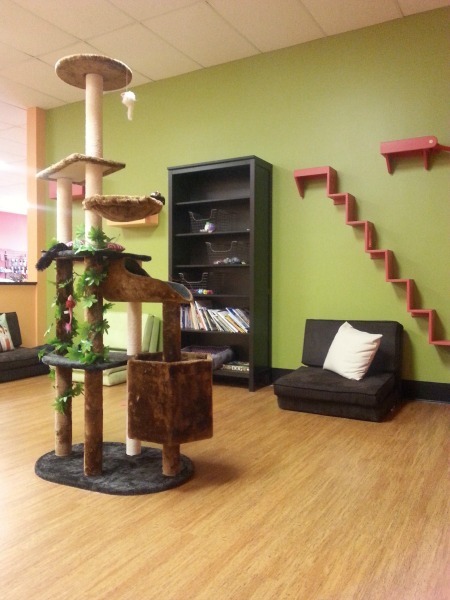 I love this idea for a birthday party and it’s so cool you have a cat café in your area! I hope does cats get adopted soon.